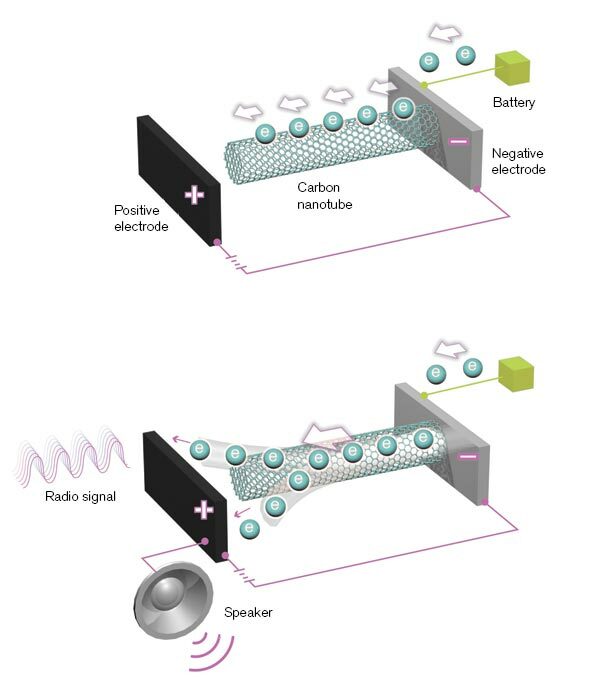 A nanoradio is a carbon nanotube anchored to an electrode, with a second electrode just beyond its free end. When a voltage is applied between the electrodes, electrons flow from a battery through the nanotube, jumping off its tip to the posi­tive electrode. A radio wave alternately attracts and repels the nanotube tip, causing it to vibrate in sync. When the tip is farther from the electrode, fewer electrons bridge the gap; the varying electrical signal recovers the audio signal encoded by the radio wave. The seminar report discusses the construction of a fully functional, fully integrated radio receiver from a single carbon nanotube. The nanotube serves simultaneously as all essential components of a radio: antenna, tunable band-pass filter, amplifier, and demodulator. A direct current voltage source, as supplied by a battery, powers the radio. Using carrier waves in the commercially relevant 40−400MHz range and both frequency and amplitude modulation techniques, seminar report demonstrate successful music and voice reception.